He Flag of Mexico is rich with historic symbolism. 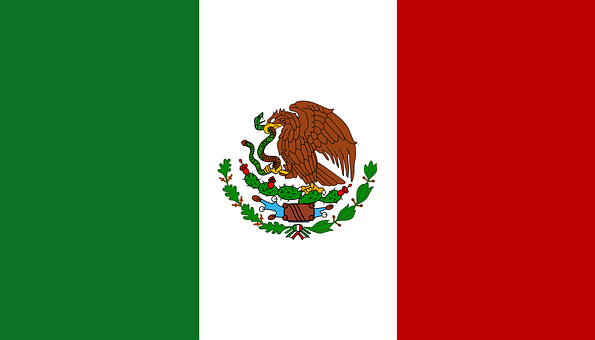 The tricolors of green, white and red with the coat-of-arms centered in the white middle stripe were adopted by Mexico following their independence from Spain during the War of Independence in 1821. There have been adjustments to the flag during background but the coat of arms has ever featured a royal eagle holding a serpent on top of a cactus. The current coat of arms was designed in 1968 by Helguera. Legend claims that the Aztecs, then a nomadic tribe wandering throughout Mexico, were awaiting a sign from the gods telling them to build their capital city. After drifting for two hundred years, they found this mythical eagle on a small island in Lake Texcoco and built their capital, Tenochtitlan, where the main plaza in Mexico City is now located. Through the years the three colors of green, white and red on the flag have remained the same but the meaning of these colors has changed. The green stripe represents Independence from Spain or may signify Hope. The white stripe represents purity of the Catholic religion or Unity. The red stripe represents Heroes blood or Religion. When the flag of Mexico is paraded in front of a crowd, bystanders increase their right arm, place their hands on their chest parallel to the center. The hand is level with the palm facing the floor. This salute is known as the El Saludo Civil de la Bandera Nacional. On February 24 annually a national celebration, Dia de la Bandera, Flag Day is held.